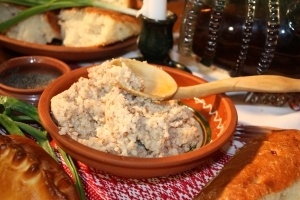 Teterya | Шинок "Коса над Чаркою"
Famous porridge of Zaporizhian Cossacks. To cook such porridge they took several types of cereals and added some buckwheat flour. They cooked all cereals so that they completely got boiled. Then they poured buckwheat flour previously stirred in water. The density of Teterya supposed to remind ‘kulish’, that is it had a consistency of watery sour cream. They dressed porridge with oil, butter, fried onion or cracklings.